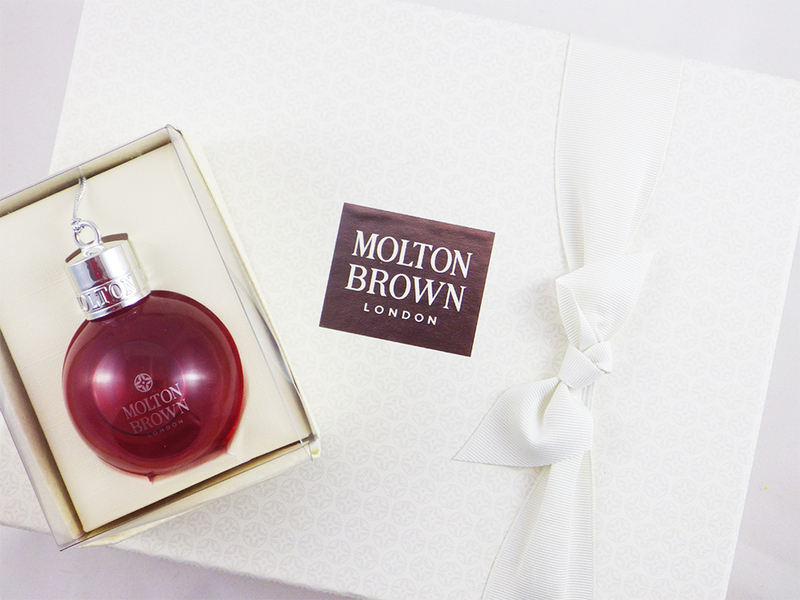 When I think of luxury and indulgence, one of the brands that spring to mind is Molton Brown. 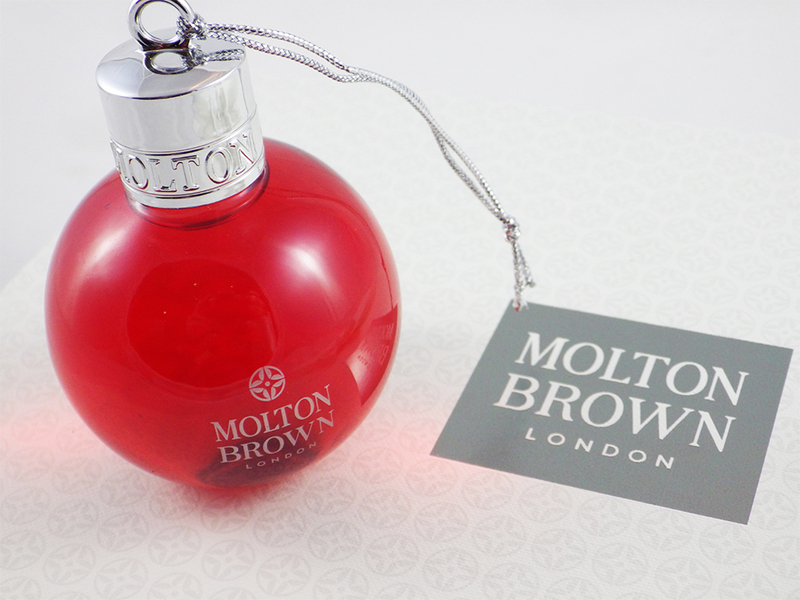 If you still are on the hunt for some Christmas gifts, whether a main present or a stocking filler, Molton Brown have plenty of options starting at £10.00. You never know you may find something for yourself at the same time! You can't go wrong with a beauty themed bauble at Christmas and there's something so simplistically stunning about their Hand Wash Bauble. It has a spicy, aromatic but slightly sweet scent of Allspice, Frankincense and Vetiver, which is perfect for the festive season. Hang it on the tree and then in the bathroom - it will not only look amazing but the thick, foaming gel will leave your skin clean and refreshed. However Molton Brown have also very practically made the bottom of the bauble flat, so it can be sat on a surface if more convenient. Everything about this set just screams indulgence. I was wowed by the beautiful packaging before I even got to the products inside; the box is patterned with Molton Brown's circular logo and simply finished with a cream ribbon. Lift off the lid and you are presented with three products; a 300ml Gingerlily Body Wash, 300ml Gingerlily Nourishing Body Lotion and a Gingerlily Mini Candle. The fragrance is a divine blend of Ginger Oil, Tuberose and Cedarwood, which is a warming, spicy, woody scent and now one that I absolutely adore. The body wash is a thick gel that lathers up well and feels soft on the skin. Follow up with the light but creamy body lotion, which is great for everyday hydration thanks to White Lily and Polynesian Tamunu Nut Oil, and you are left with the most amazing smelling skin! The scent lingers for absolutely ages afterwards. The Gingerlily Mini Candle is small but perfectly formed in its glass casing in a festive orange colour. I'd say I got about 8-10 hours burn time and to really enjoy the scent, I'd recommend burning it in a smaller room otherwise it does get lost. 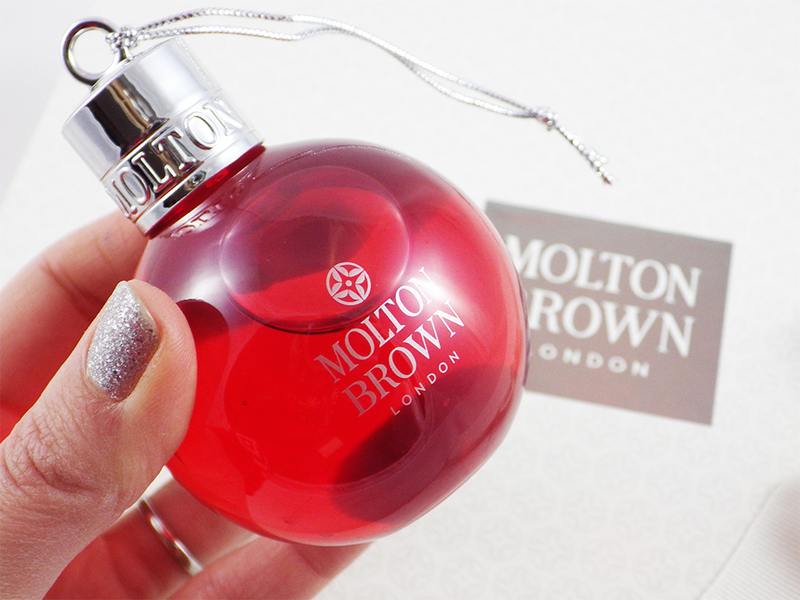 What do you think of Molton Brown's Christmas Gift Range? Have you tried any of their products and if so, which is your favourite? Omgosh, I love that bauble! Such a cute idea. I've never tried any of their products, but these look like such good little gifts! The bauble is adorable too!